May 23 Online : I have nothing but great thing's to say about May 23 Online. They have a cute selection of female clothing, hip, in the now, and fashionable. I was given the wonderful chance to review a shirt from May 23 online. It was a hard choice what to get because they had many different items that I wanted to review. But when I seen the Handgun Tee I had to have it! I chose the wine and white Handgun tee because it's an extraordinary tee that I have never seen before. Its cute and a great fashion statement. I loved the wine color and the cartoonish style of gun. 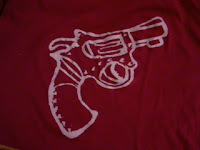 The gun print lays on the right side of the tee shirt. The tee shirt is made from a soft 100% cotton material and is Made in Vietnam. (Wash before wearing - Cold water, Tumble dry) I did the wash/dry/iron test the tee came out perfect, there was no shrinkage, pealing of the print, and no fading of the colors. May 23 Online has other amazing bold prints in tee's and they have (children) styles.